Sliding into a fluffy sleeping bag after a long day of hiking is one of the most satisfying experiences on the trail. The daytime is meant for traversing ravines and climbing mountains, but at night all a weary explorer wants is to shimmy into a warm cocoon and catch some Zs, swaddled snugly in a cozy cloud like a little angel baby. Thing is, sleeping in a cloud would be awful if you think about it. You’d be wet and cold, not to mention hundreds of feet in the air. Feathers are more comfortable, especially DriDown-treated feathers. Trust me. So, rather than clouds, we suggest the Kelty Cosmic Down 20 sleeping bag. For the price, you’d be hard-pressed to find a better bag. The 600-fill of hydrophobic down is wrapped in a durable 50D polyester taffeta liner and a ripstop shell, all of which is shaped into a mummy-style bag that hugs your body in the right places. Features such as the adjustable hood, draft collar, and draft tube work well to hold in your warmth. Clouds? They just don’t come close. For its price, comfort, and history of use, we recommend the Kelty Cosmic Down 20 sleeping bag as our Budget Pick for the Wilderness Backpacker. The Kelty Cosmic Down 20 is considered the classic entry level down backpacking sleeping bag. It’s not super cheap, but for a fully down bag with high quality materials the price is hard to match. The Cosmic Down 20 is quite light, compressible, and warm, making it a very versatile companion in almost any season, and the materials are strong enough to last for years. Learn more about sleeping bags in our comprehensive guide. Read on to see the rest of our Kelty Cosmic Down 20 review. Update: The Kelty Cosmic Down 20 is a staple, and doesn’t change that often. Kelty updated it in 2016, and the bag is not received a major revision in 2019. Weight 2 lbs 13 oz (1.266 kg) Not the lightest bag out there, but a very respectable weight. Anything under three pounds is considered “reasonable” for backpacking. Type Mummy Bag The Cosmic Down 20 is a typical mummy bag. It gets narrow around the waist and feet, has a cinch hood, and hugs you. More on sleeping bag types in our Guide. Size Short, Regular, Long, Women’s The Cosmic Down 20 is offered in a men’s bag in three sizes, and one size for women. The main differences are length, and the women’s bag is warmer (and shorter) overall. We tested the Regular. EN Testing EN Lower Limit: 19°F / -7°C The Lower Limit means this bag will technically be comfortable to 19 degrees. However, through our tests “comfortable” isn’t really the word. Survivable is the word. This is a common issue with sleeping bags and the EN testing system, and we feel the rating should be higher. More on sleeping bag EN testing in our guide. Insulation Type 600-fill power DriDown The low end of acceptable down fill power for sleeping bags. The DriDown means it is treated to be hydrophobic (water resistant). More on sleeping bag insulation types in our Guide. Water Resistant? Yes The DriDown helps keep water from saturating the down, but is most effective in quick dry times. The shell is DWR treated, so overall this bag repels moisture well. Fill Weight 18 oz (.510 g) The fill weight is literally how much just the down weighs in a bag. In this case it’s less than half the weight of the bag, which indicates the bag has burly fabric and zippers. It also makes for a colder bag — if the fill weight were higher it would be warmer. Both the exterior and interior of the bag are 50D, which provides plenty of strength and durability. The shell is “down proof”, meaning it resists down feathers poking through. More on sleeping bag Denier ratings in our to Guide. Baffle Pattern Horizontal The baffles on the Cosmic Down 20 are a simple horizontal pattern. This is the most common baffle type for mummy bags. More on sleeping bag baffle patterns in our Guide. Zipper Length, Type Full length 60 in. dual-slider, locking zipper This zipper is the entire length of the bag and built for use. Large pull tabs help to locate it in the night, but it is a little more delicate than we’d prefer. Draft Tube? Yes Solid draft tube that works very well to keep cold air from coming through the zipper. Draft Collar? Yes The draft collar helps to trap in warmth around your head and makes this bag furnace-esque. Pocket? No A budget backpacking bag doesn’t include pockets! Manufacturer Warranty Limited Lifetime Warranty Kelty branded products are warranted to the original owner against manufacturing defects in materials and workmanship for the lifetime of the product. This includes sleeping bags. If you find an issue, send it in. Retail Price $159.95 A low price for a warm, lightweight down sleeping bag. Often on sale, too! I had been itching to venture into Southern Oregon’s Wild Rogue Wilderness for quite some time. The gorgeous Rogue River is famous for its wild rapids and plentiful salmon, but there’s also a little-used system of trails that follows the river for many miles and veers off into the mountains of the Siskiyou National Forest. I invited my father and sister to join me on this trip. Neither had backpacked before, so I outfitted them with my spare gear and prepared them for the journey ahead. It’s so much fun introducing new adventurers to the wilderness! Hiking up to Panther Ridge, we found evidence of wildlife all around. It was exciting, especially so for the newbies. Bald eagles rested in the trees above, trout jumped in the river, elk prints lined the trail…and ticks crawled on our legs, mosquitos stung wherever they could, and the poison oak harassed us on the trail’s edge and from the trees above. Now that’s what I call a well-rounded day in the wild! Camping on the ridge made for a chilly evening. Fog settled in around us, sapping the warmth right out of the air. The temperature plummeted below 40 degrees during the night, quite the turnaround from the humid heat of the day. I’m glad we planned properly, and that I had the Kelty Cosmic Down 20 to wrap myself in. The Kelty Cosmic Down 20 still in its stuff sack. Lots of info! One quick tick check after dinner. None? Good. Time to get in the bag! Kelty sleeping bags have kept me warm on many a cold trail night. I’ve backpacked with them before, but the Kelty Cosmic Down 20 was new to me. I wanted to trust it, to believe it would keep me warm, so I kept my clothing to a minimum. I left my hat, gloves, and jacket in my bag, deciding to wear only a thin wool shirt, equally thin socks, and my plaid pajama bottoms. I chatted with my sister and father through the walls of our tents, the three of us reliving the beautiful sights and pains of the day. Conversation dwindled as the air chilled. A light wind picked up, blowing fog through the trees, and droplets formed on the pine needles above, which soon dripped onto our tents. I was struggling to warm up and started thinking that maybe I would need to get my extra clothes after all. So I checked to see that the Cosmic’s zipper was fully closed, then I pulled on the cord that was near my face, cinching the sleeping bag’s hood down tight. Only my big nose was exposed to the frosty air. In order to get the full warmth of the Cosmic Down 20, you have to get real familiar with the hood. Ensconced is the word. Within minutes of sealing myself in I felt the heat return to my face, and then to my limbs. The draft collar was conveniently adjustable, allowing me to control just how much heat escaped with a simple movement of the fabric. This helped me cool off my upper body in the middle of the night without having to unzip the bag. The Kelty Cosmic Down is quite roomy for a mummy bag. I had a comfortable amount of wiggle-room from head to toe, which made it easy to sleep on my back or roll over to my side.The bag kept me warm overall, but there were a couple of cold spots around the lower half of my body. With a lower limit rating of 19 degrees the bag should keep you warm to that temperature, but I suspect it would be uncomfortably cool, especially down near your feet. You should bring some extra layers if you’re going to push it to its limits. The draft tube on the sleeping bag is solid, and helps to prevent cold air from seeping through the side. I didn’t have issues here as much as cold spots on the legs. Condensation covered the Cosmic and everything else that night on the ridge, but it didn’t soak through the bag, and the morning sun dried out the DriDown feathers quickly. Sleeping in a soggy sleeping bag is like snoozing with a wet dog under your bedsheets, something you never want to do. The Cosmic’s DriDown is like moisture insurance, and any water-based insurance in the Pacific Northwest is a good idea. The hood and draft collar were my favorite parts of the Kelty Cosmic Down. The adjustments were simple and easy to use, helping me maintain just the right amount of ventilation. The draft tube along the zipper functioned well, and the zipper itself was smooth and lived up to its anti-snag claim during this trip. The red fluff along the top is the down collar, which goes a long way to keeping the warmth in. Tighten it around your face when you think you need more clothes. The Cosmic compresses down to the size of a bowling ball, which is impressive, and it weighs in under three pounds. You won’t even notice it in your backpack, but don’t bother bringing it to the lanes. The Cosmic Down 20 next to a water bottle. Note that this is the included stuff sack, not a compression sack, so it can get smaller. Snug as a bug in a rug. Cinch it tight or let it hang loose, the Kelty Cosmic adjusts to your needs and protects you from the elements. Adjustable heat-keeping tools like the draft tube and collar upped the comfort level. If you can’t find your sweet spot right off the bat, try adjusting one of these features. I was warm throughout the night, and the DriDown kept the moisture at bay. Keep in mind, my coldest tests were in the mid 30s and I didn’t have to pull out the super warm layers. That said, the 20 degree rating on the Cosmic Down 20 may be a bit of a stretch. It’s a Lower Limit rating, which means it is the lower range of comfort for most men at that temperature. But, as experienced sleeping baggers know, these ratings are usually inflated. You need a super warm pad, extra layers, and an internal furnace to truly be comfortable at that temperature. Beware: this bag may not prevent cold feet. If you go in knowing this and bring the right layers, you should be fine in most temperatures down to freezing. Kelty’s solid reputation and product warranty could stand as enough evidence to prove this bag’s quality. The fabric feels sturdy enough to withstand normal use, and you could probably sleep directly on the hard ground night after night without tearing into it. That said, the zipper performed fine as a brand new piece, but it feels a little light, almost flimsy. I’d take care not to pull at it too hard and keep it clean of dirt. A functional zipper, but not the burliest one in the world. Handle it carefully. Room to spare just about everywhere. I have quite a large noggin and it didn’t nearly fill the hood space. The rest of the bag had enough room for me to roll around, though it was still cozy enough with its mummy shape that followed the curves of my body. It’s comfortably big, like an over-sized t-shirt. For reference I’m 5’10”, weighing in at roughly 180 pounds (no, I’m not looking for a companion). The Cosmic Down 20 I tested was a size regular in the men’s version, and Kelty makes longer or shorter bags for your size and/or gender. The Cosmic Down 20 has a somewhat relaxed mummy shape. I had only one true grievance with the Kelty Cosmic Down 20. The cold spots on my legs. For a 20 degree bag I wouldn’t expect this to happen during a mid 30s night. It is made of down feathers, so I made sure to fluff up the baffles and shake the bag a bit to spread out the insulation. Maybe I didn’t check it well enough, or maybe it doesn’t have quite the fill it should. Make sure to shake the down fill to prevent cold spots. That said, I was still warm overall and would take the Cosmic out again. Just have to shake, shake, shake it some more to get those feathers in line. The Kelty Cosmic Down 20 is a budget sleeping bag loaded with convenient features for the average backpacker. DriDown doesn’t come at a better price unless you’re plucking the bird yourself. We tested the Kelty Cosmic Down 20 in a size Regular, which is the men’s version of the sleeping bag. It’s also offered in a Short and Long, so make sure to get the length that fits you. The Cosmic Down 20 is also offered in a Women’s specific version, which is a warmer, heavier, and shorter bag overall. We recommend the men’s and women’s Cosmic Down 20 bag, and you can find it below. 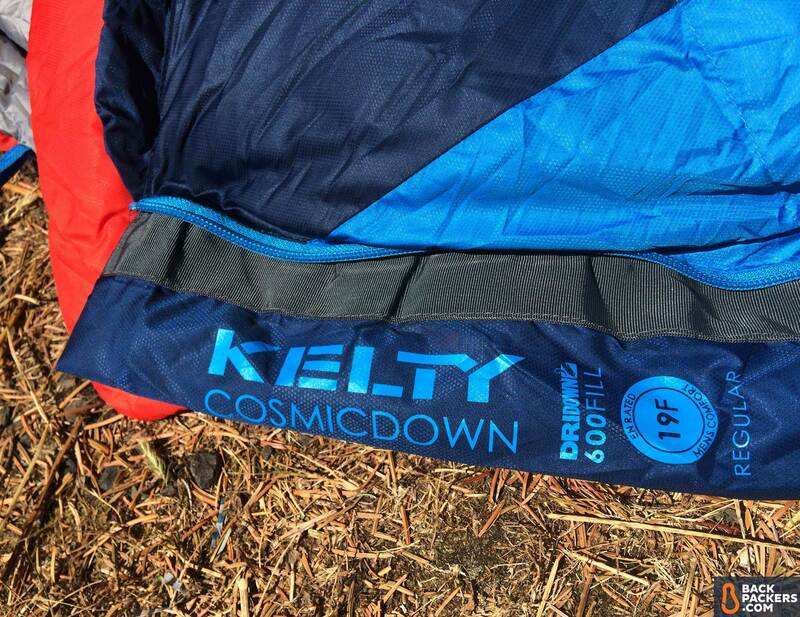 Kelty also offers the Cosmic Down construction in 40 degree and 0 degree versions. The 40 degree is great for summer use, and the 0 degree works well in sub-freezing weather. While both of these will work, we find the versatility and weight of the Cosmic Down 20 to be the best bet for most people. You can find the other versions below. Compare Kelty Cosmic Down prices below.